A powerful and original argument that traces the roots of our present crisis of authority to an unlikely source: the meritocracy. Over the past decade, Americans watched in bafflement and rage as one institution after another – from Wall Street to Congress, the Catholic Church to corporate America, even Major League Baseball – imploded under the weight of corruption and incompetence. In the wake of the Fail Decade, Americans have historically low levels of trust in their institutions; the social contract between ordinary citizens and elites lies in tatters. How did we get here? With Twilight of the Elites, Christopher Hayes offers a radically novel answer. Since the 1960s, as the meritocracy elevated a more diverse group of men and women into power, they learned to embrace the accelerating inequality that had placed them near the very top. Their ascension heightened social distance and spawned a new American elite--one more prone to failure and corruption than any that came before it. Mixing deft political analysis, timely social commentary, and deep historical understanding, Twilight of the Elites describes how the society we have come to inhabit – utterly forgiving at the top and relentlessly punitive at the bottom – produces leaders who are out of touch with the people they have been trusted to govern. Hayes argues that the public's failure to trust the federal government, corporate America, and the media has led to a crisis of authority that threatens to engulf not just our politics but our day-to-day lives. Upending well-worn ideological and partisan categories, Hayes entirely reorients our perspective on our times. 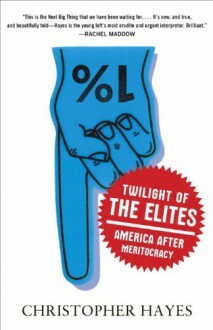 Twilight of the Elites is the defining work of social criticism for the post-bailout age.